For the 3rd year, AVA-Berlin sponsored a film at the ONE WORLD BERLIN FILM FESTIVAL: GRANITO: HOW TO NAIL A DICTATOR (USA 2010), directed by Pamela Yates at ARSENAL Kino followed by a Q and A moderated by Anjana Shrivastava of AVA- Berlin (left) with Director Pamela Yates (middle) and Producer Paco De Onis (right). 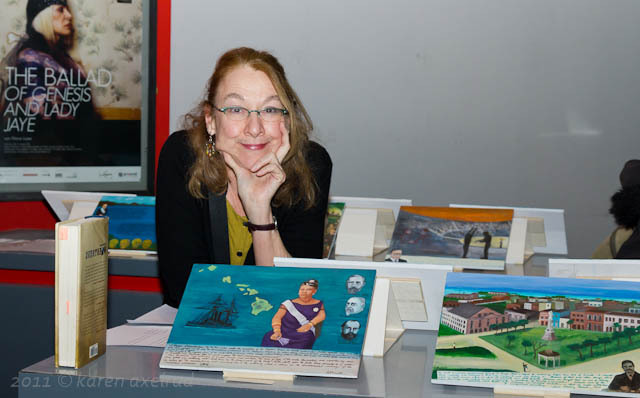 AVA’s Carolyn Prescott exhibited in the Arsenal lobby a series of 14 paintings on American-sponsored regime change, including one that featured Guatemala. These small, narrative paintings make use of the traditional genre of Latin American retablos “to envision and make concrete historical events that seem distant and abstract.” More photos here. GRANITO deals with the Guatemalen massacres of the 1980s. Here is an interesting review. Watch a trailer for Granito. This entry was posted in Archive, Event and tagged American Voices Abroad-Berlin, AVA-Berlin, Carolyn Prescott, event, Granito, human rights, Menschenrechte, One World Berlin Film Festival, Pamela Yates. Bookmark the permalink.